Tsokye Tuktik, with Guru Tsokyé Dorje as the central figure, Orgyen Menla on bottom left, Dorje Drolö on bottom middle and Lama Orgyen Khandro Norlha on bottom right. Tsokye Tuktik (Tib. ཟབ་ལམ་མཚོ་སྐྱེས་ཐུགས་ཐིག་ལས༔་མ་ཧ་གུ་རུ་ཕྱི་ལྟར་ཨོ་རྒྱན་སྨན་གྱི་བླ་མར་སྒྲུབ་པ་, Wyl. zab lam mtsho skyes thugs thig las: ma ha gu ru phyi ltar o rgyan sman gyi bla mar sgrub pa) 'Heart Essence of the Lake-Born Vajra, the Secret Accomplishment of the Great Guru' is a mind terma of Dudjom Rinpoche focused on Guru Rinpoche in the form of Guru Tsokyé Dorje, which was revealed in 1929. It is the main lama practice in the Dudjom Tersar lineage, and one of the four main terma cycles of Dudjom Rinpoche. The Tsokye Tuktik is a lama practice focused on Guru Rinpoche. 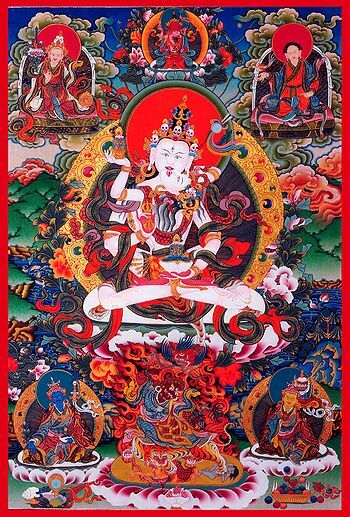 The outer form of the lama is Orgyen Menla Dütsi Bum Zang, the inner form is Lama Orgyen Khandro Norlha, the secret form is Tsokye Tuktik (Lake-Born Vajra, Guru Tsokyé Dorje) and the innermost form is Lama Drakpo Taphur . Since Dudjom Rinpoche holds Guru Rinpoche in the greatest esteem, he states that his purpose in writing this sadhana [of the Tsokye Tuktik] is to help us attain the sale level as Guru Rinpoche. He further states that his composition will present the methods or practices (tsul) we should follow in order to approach (nyen) and accomplish (drup) Guru Rinpoche. The practice was revealed by Dudjom Rinpoche in 1929, while he was still in Tibet. According to him, “the Tsokyi Tuktik is the father cycle connected to the Khandro Tuktik mother cycle”. About the Tsokye Tuktik, Dudjom Rinpoche said “For the fortunately connected students, I released the secret seal of the casket spontaneously arisen from the space of awareness”. ↑ The three other cycles are the Pudri Rekpung cycle, the Khandro Tuktik cycle and the Dorje Drolö cycle. ↑ In the actual source texts of the Tsokye Tuktik, the innermost secret form of the lama is Lama Drakpo Taphur, and not Dorje Drolö. But it seems that, as shown on many Tsokye Tuktik thangkas, oral lineage instructions have recommended students to focus on Dorje Drolö practice as the innermost secret form of the lama, considering the importance of the Dorje Drolö cycle in the Dudjom Tersar lineage. ↑ The translation of the Tsokye Tuktik index is based on the work of Ngak'chang Rangdrol Dorje. ↑ Lama Tharchin Rinpoche, ‘Teachings on The Heart Essence of the Lake Born, The Secret Sadhana of the Great Master’, Bero Jeydren Translations, Seattle, Hawai and Los Angeles, 1999. ↑ Khenpo Tsewang Dongyal, Light of Fearless Indestructible Wisdom, The Life and Legacy of Dudjom Rinpoche (Snow Lion, 2008), page 183. This page was last edited on 13 May 2018, at 17:27.